The Stout Research Centre for New Zealand Studies is delighted to announce that the John David Stout Research Fellow for 2014 will be Dr Vincent O'Malley, research director of HistoryWorks Ltd.
Dr O’Malley’s most recent book, The Meeting Place: Maori and Pakeha Encounters, 1642-1840 (2012), was a finalist in the general non-fiction category of the New Zealand Post Book Awards this year. 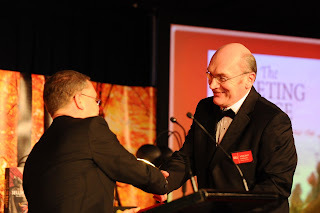 He is the author of four books on relationships between Maori and Crown and Pakeha, in addition to many book chapters and journal articles, and reports for the Treaty of Waitangi settlements processes. During the fellowship, Dr O’Malley will be working on a book on the Waikato War, 1863-4. 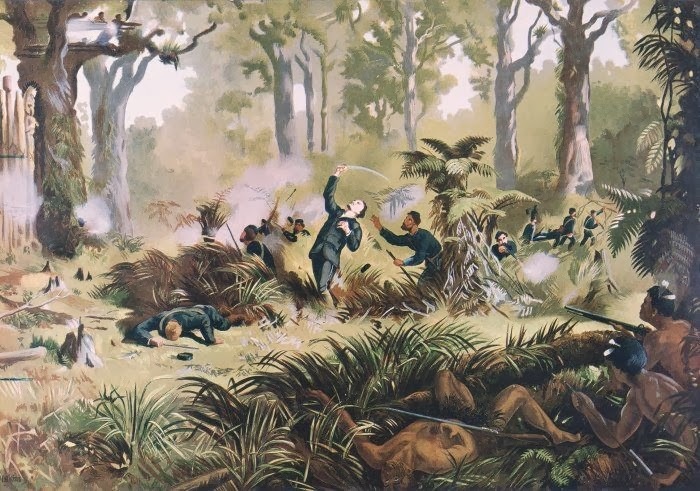 This was a pivotal turning point in the history of New Zealand, yet no major study has been undertaken since 1879; it is apt that Dr O’Malley will be exploring this subject in the year that marks the sesquicentennial of the final battles of the Waikato War. 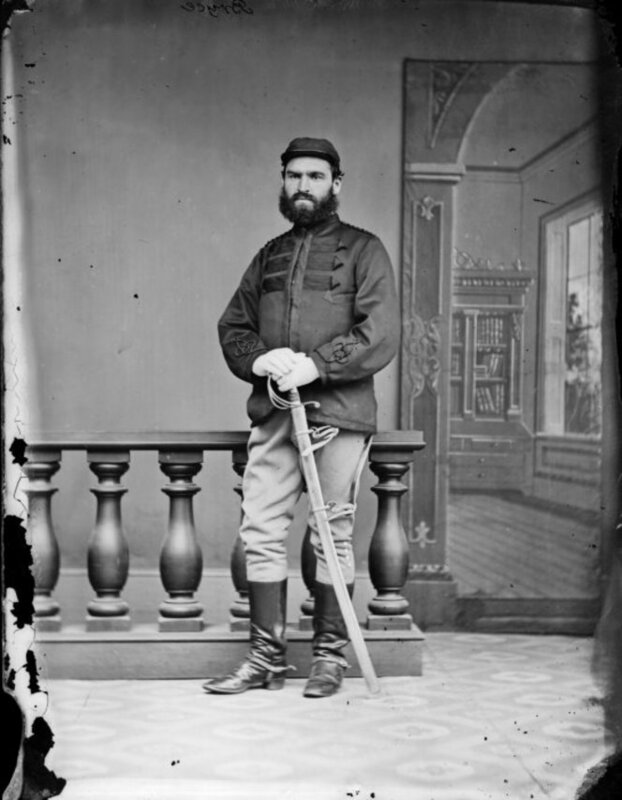 The reference to 1879 is to John Featon's book, The Waikato War, published in that year. In this, the sesquicentennial of the outbreak of the Waikato War, we might ask why the relative historical amnesia with respect to wars fought on our own shores, especially compared with the veritable mountain of works on New Zealand's involvement in various overseas conflicts. Part of the answer might lie in the fact that the Waikato War does not fit into a nation-building paradigm. At one time settlers (but not Maori) celebrated Orakau as the moment when New Zealand developed 'the greatest race relations in the world', through the mutual respect both sides were said to have had for one another. That can no longer be sustained, now that we know about the well-documented atrocities committed by British troops during that conflict. But a new narrative around the wars has yet to emerge, hence the kind of uncomfortable silence. These are questions I hope to explore in my project. 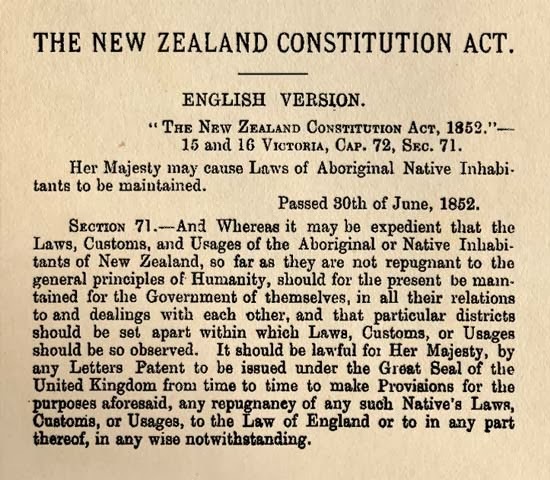 Asked to nominate the point at which relations between Maori and Pakeha had really begun to turn sour in the nineteenth century, many historians would likely nominate the passage of the New Zealand Constitution Act 1852. As Chichester Fortescue famously told the House of Commons in 1861, from the time of the 1852 Act the governor had been ‘[o]bliged to act under a Constitution which appeared to have been framed in forgetfulness of the existence of large native tribes within the dominions to which it was intended to apply’. 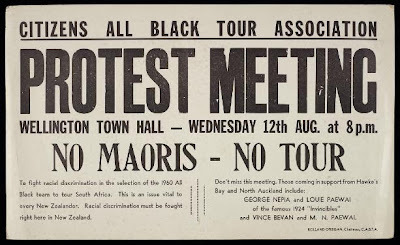 With the benefit of hindsight it is all too easy to assume that ‘absent-minded imperialists’ really had forgotten their obligations to Maori. But a close analysis of British Parliamentary debates on the measure (limited though discussion was with reference to Maori) suggests this was not entirely true. The effect of the 1852 Act was to establish a General Assembly nominally open to all though in practice restricted to Pakeha. 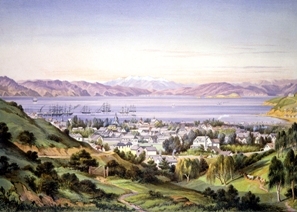 But British MPs assumed that some Maori closest to European towns would be eligible to vote under the new constitution. They further assumed that most other Maori would be removed from the General Assembly’s jurisdiction under the section 71 provision enabling ‘native districts’ to be declared. Under these circumstances there would be little real injustice provided both measures (a franchise based exclusively on European land tenure and separate ‘native districts’) were implemented together. 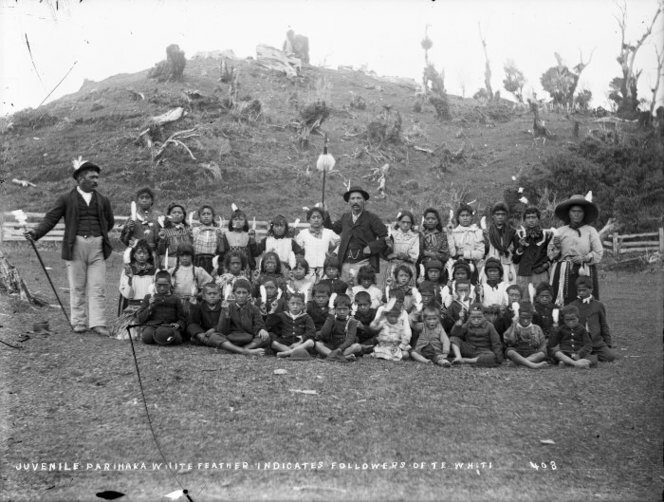 The problem, it is suggested, was less that settlers were granted self-government than that a tandem measure which would have effectively delivered a similar outcome for many Maori was not. There is little doubt that the Act, as implemented, was a disaster. 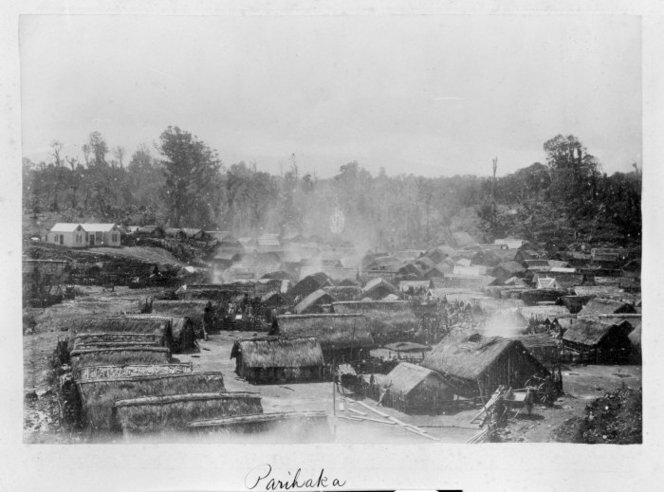 It coincided with a growing crisis in relations between Maori and the government, sparked in large part by concern that rangatira were being shut out from a share of the governance of the colony and instead increasingly subject to the whims of general and provincial assemblies from which they were excluded. 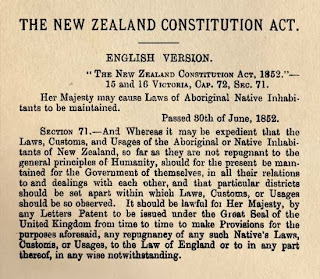 Such an outcome arguably could have been avoided had Maori been enfranchised at anything like the level British parliamentarians assumed would be the case, and had definite instructions been issued by the Colonial Office for section 71 to be utilised in predominantly Maori districts. 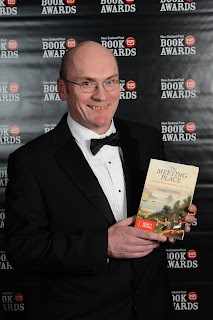 It was a great thrill this week when my most recent book was announced as one of four finalists in the general non-fiction category for the 2013 NZ Post Book Awards. The Meeting Place: Maori and Pakeha Encounters, 1642-1840 was published by Auckland University Press last year. It explores the early relationships between Maori and Pakeha across New Zealand and argues that, over time, both parties learned to rub along with one another because both had things of value that the other wanted. But that world of mutual self-interest changed dramatically in the decades after 1840 as a large influx of new settlers upset the previous rough-and-ready balance of power upon which mostly harmonious relations had been built. The award winners will be announced at a ceremony to be held in August on 28 August. In the meanwhile members of the public are invited to play their part by selecting the winner of the People’s Choice Award. Voting ends on Sunday 18 August, with the winner also to be announced ten days later. I had the great privilege of travelling to Rukumoana Marae, near Morrinsville, on 18 July this year for the signing of the Ngati Haua deed of settlement and formal apology from the Crown. 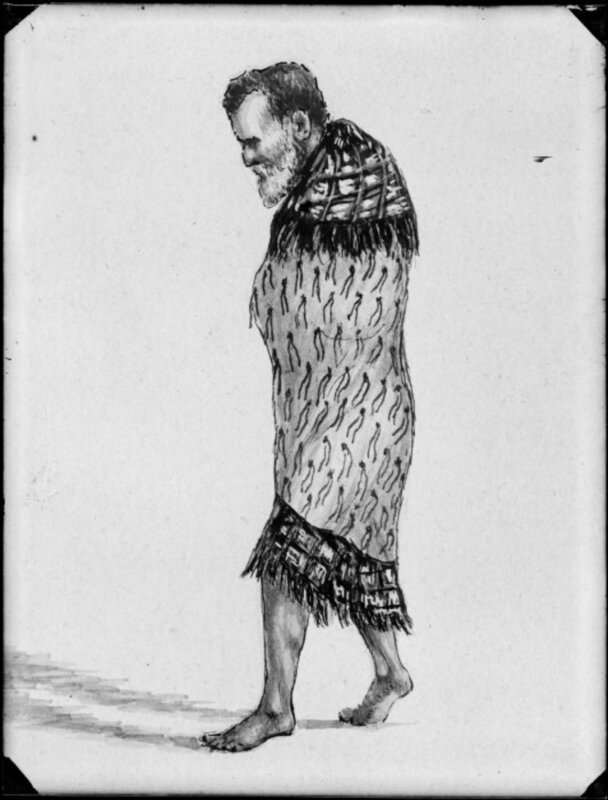 The date for the occasion had been specially selected to mark the anniversary of one of several petitions filed by the great Ngati Haua rangatira Wiremu Tamihana on 18 July 1865. In his petition, Wiremu Tamihana referred to the anguish of being called ‘an evil man, a rebel’ and a murderer. He called on the government to establish an independent inquiry into the causes of the Waikato War and to restore the lands wrongly confiscated from Ngati Haua and other Waikato Maori. Although the Crown rejected Wiremu Tamihana’s pleas, the apology read out to the large crowd assembled at Rukumoana Marae by Treaty Negotiations Minister Chris Finlayson finally acknowledged the great injustices inflicted on Ngati Haua, who had been reduced to virtual landlessness through confiscation and other Crown actions. In addition to a formal apology, Ngati Haua received $13 million compensation, in addition to a range of cultural redress measures, as part of a fast-tracked settlement that was completed in a little over six months. The HistoryWorks team (myself, David Armstrong and Bruce Stirling) assisted with research for the claim, along with drafting and negotiation of the agreed historical account with the Crown. In June of this year I attended a conference on ‘Cooperation and Empire’ at the University of Bern, Switzerland. The conference, which was attended by scholars from around the world, was notable for a substantial New Zealand presence, led by James Belich, formerly at the Stout Research Centre, Victoria University of Wellington, now Beit Professor of Imperial and Commonwealth History at Oxford University. 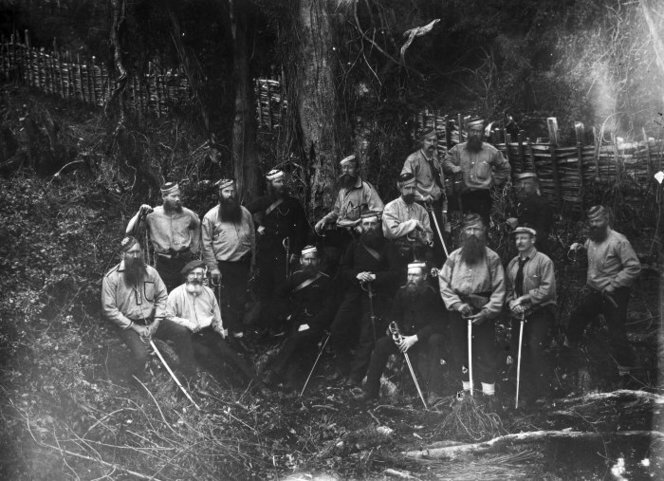 My own paper explored the role of kupapa in the New Zealand Wars of the nineteenth century. I explored how a term which initially meant those who stooped or remained low (that is, people who remained neutral in a conflict) had today come to assume almost entirely negative connotations. I argued that the notion that kupapa were ‘Uncle Toms’ or traitors was fundamentally wrong. 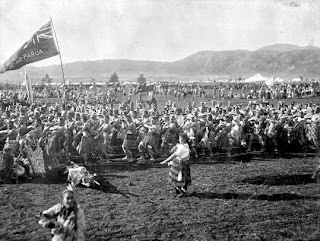 Far from selling out their people, those Maori also referred to in English as ‘Queenites’, ‘friendlies’ or ‘loyalists’ were endeavouring to advance the interests of their communities through strategic alliance with the Crown. They did so, I argued, out of a range of motives, few of which had much to do with whether they supported the imperial project. There was no such thing as blind adherence to the Crown or its cause. Besides attending the conference, I also had the opportunity to explore the beautiful city of Bern, whose historic old town was declared a UNESCO World Heritage Site in 1983. It is expected that the conference proceedings will eventually be published. Book Review: Lynette Russell, "Roving Mariners: Australian Aboriginal Whalers and Sealers in the Southern Oceans, 1790-1870"
Lynette Russell. Roving Mariners: Australian Aboriginal Whalers and Sealers in the Southern Oceans, 1790-1870. Albany: State University of New York Press, 2012. xiv + 221 pp. $80.00 (cloth), ISBN 978-1-4384-4423-9; $29.95 (paper), ISBN 978-1-4384-4424-6. The whaling and sealing industries that emerged in the Pacific and Southern oceans from the late eighteenth century have attracted significant interest from historians over recent decades. A particular focus has often been on the relationship between the whalers/sealers and indigenous groups they encountered and interacted with on a frequent basis. But that represents something of a false binary. It has long been known that New Zealand Maori and other Polynesian and South Pacific communities took an active part in sealing and whaling work. Now, thanks to Lynette Russell’s short but impressive work, we also need to account for significant Australian Aboriginal engagement with both fields of employment. And the ironic thing is that the particular Aboriginal communities most heavily involved were among those usually considered the greatest victims of colonization and something approaching genocide (or what might be seen as a form of “ethnic cleansing”). Russell does not deny the tawdry and tragic history of European onslaught in Australia. But she does ascribe a form of “attenuated agency” to those Aboriginal men and women at the heart of her book. They might not have been free to choose from a range of ideal options. But they did have some choices. And for some Aborigines, life in the sealing and whaling communities offered a kind of relief from the relentless racism otherwise directed at them. As Russell notes, skin color mattered less in the multiracial, multilingual world of sealing and whaling than elsewhere. Competency was what counted, and Aborigines could gain respect and status that might have eluded them elsewhere. Indeed, profitability and safety depended upon diverse men (and women) learning to get along with one another. Take William Lanné. Erroneously known both in his lifetime and subsequently as the last Tasmanian Aboriginal male, Lanné was among a small group of Tasmanian Aborigines to avoid removal to the Flinders Island Aboriginal settlement, before being captured and taken there as a seven-year-old with the rest of his family in 1842. Having been moved to the Oyster Cove settlement, Lanné gained a measure of financial independence and status when he took up whaling as a young man, traveling to New Zealand and throughout the Pacific. Lanné’s life has been overshadowed by his death, and in particular the gruesome mutilation and dissection of his body that then followed. 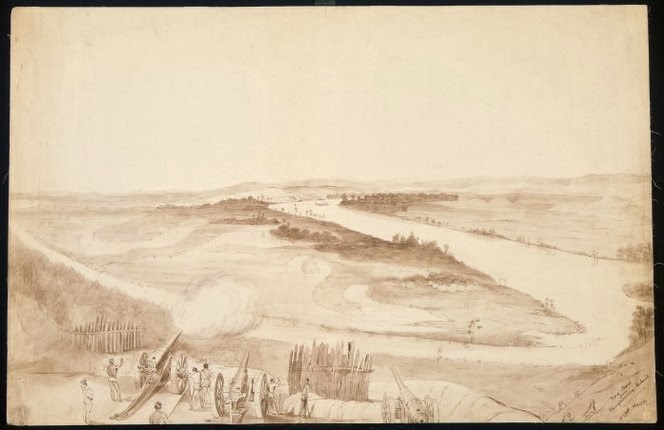 However, Russell argues that such a focus ignores the extent to which Lanné was able, during his lifetime, to assert his autonomy and seek out the opportunities that colonization offered. Other Aboriginal men pursued similar opportunities. Tommy Chaseland, who famously settled in southern New Zealand and married into the local Maori community, is perhaps the best-known example. Yet where Russell’s work really impresses is in its efforts to recover the otherwise largely invisible role of Aboriginal women in the sealing industry. Conventionally portrayed as the unfortunate victims of violence at the hands of European men, such women took an active role in sealing in their own right. Both Aboriginal men and women resisted and adapted to the newcomers in complex and sometimes subtle ways. In some respects whaling and sealing proved less disruptive of Aboriginal ways of life than other forms of European intrusion. Aboriginal women customarily hunted seals. Meanwhile, ancient rock art suggests that some Aboriginal communities had been harvesting beached whales for thousands of years. As Russell points out, shore-based whaling generated vast amounts of whale meat that was unpalatable to many Europeans but attracted large numbers of Aborigines to the fringes of whale stations. In this way, whaling actually helped to buttress and reinforce customary forms of feasting and exchange. And Aboriginal men who had spent many years developing their skills with spears sometimes became highly valued as harpoonists aboard the whaling ships. Russell succeeds in telling a story beyond the familiar one of Aboriginal dispossession. Her work serves to highlight the way in which nineteenth-century racial categories that can all too often seem fixed and immutable were in some circumstances more slippery and nuanced. That Australian Aborigines were in general victims of colonization seems undeniable. But in revealing another side to that history through the story of Aboriginal engagement with whaling and sealing, Russell reminds us that the exceptions and complexities of cross-cultural interaction are also important. Citation: Vincent O'Malley. Review of Russell, Lynette, Roving Mariners: Australian Aboriginal Whalers and Sealers in the Southern Oceans, 1790-1870. H-Empire, H-Net Reviews. July, 2013. On Wednesdays from 12.30-1.30pm during the month of August, the Central Library will be hosting a series of history talks covering the social, urban and Māori history of Wellington. Have a read of the programme below, and come along! Europeans quietly living on their own lands in Waikato have been driven away; their property has been plundered; their wives and children have been taken from them. By the instigation of some of you, officers and soldiers were murdered at Taranaki. Others of you have since expressed approval of these murders. Crimes have been committed in other parts of the island, and the criminals have been rescued, or sheltered under the color [sic] of your authority. You are now assembling in armed bands; you are constantly threatening to come down the river to ravage the settlement of Auckland, and to murder peaceable settlers. Some of you offered a safe passage through your territories to armed parties contemplating such outrages. The well-disposed among you are either unable or unwilling to prevent these evil acts. 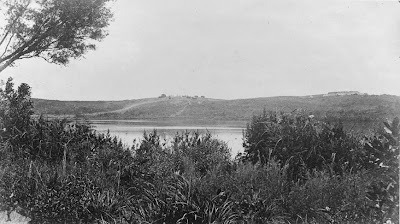 I am therefore compelled, for the protection of all, to establish posts at several points on the Waikato River, and to take necessary measures for the future security of persons inhabiting that district. The lives and property of all well-disposed people living on the river will be protected, and armed and evil-disposed people will be stopped from passing down the river to rob and murder the Europeans. Those who remain peaceably at their own villages in Waikato or move into such districts as may be pointed out by the Government, will be protected in their persons, property, and land. Those who wage war against Her Majesty, or remain in arms, threatening the lives of Her peaceable subjects, must take the consequences of their acts, and they must understand that they will forfeit the right to the possession of their lands guaranteed to them by the Treaty of Waitangi, which lands will be occupied by a population capable of protecting for the future the quiet and unoffending from the violence with which they are now so constantly threatened. Many of the allegations levelled against the Waikato tribes were demonstrably false. Grey and his ministers had already determined some weeks earlier to invade Waikato and were looking to justify that decision. This date is fallacious. I met the messenger, carrying the first copies printed in the native language, on the evening of July 14th, at dusk. He was then on the road between Auckland and Otahuhu, and did not reach Waikato until after the battle of Koheroa, which was fought on the 15th. In other words, the ultimatum was a retrospective one, issued after troops had already invaded the Waikato. 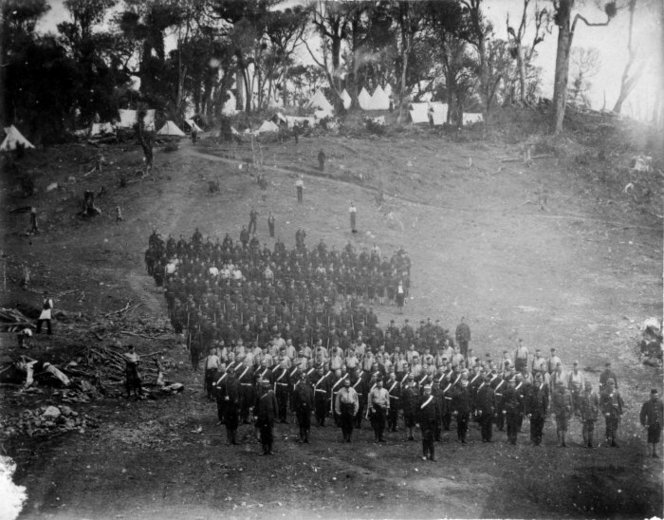 The ultimatum had been intended mainly to suggest that the Crown went to war reluctantly, only after all other options had been exhausted, and after Waikato Maori had been given full opportunity to comply with the Crown’s demands. But they hadn’t. It was a sham ultimatum, issued to provide a fig leaf of decency for the lie that this was a just war.